A US-UK trade deal "will absolutely be possible", Donald Trump has said, hours after he told The Sun Theresa May's Brexit plan could kill an agreement. 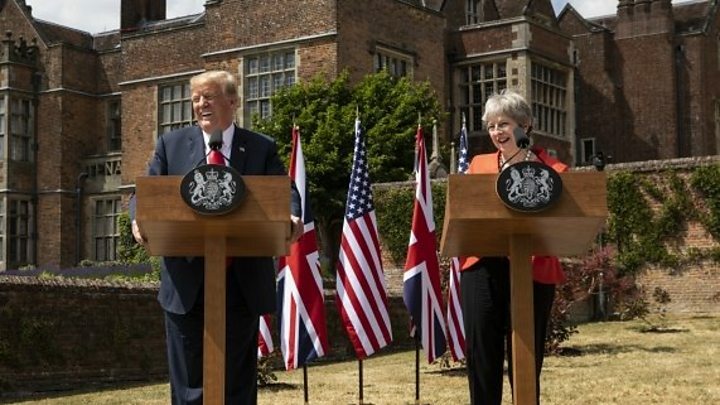 Speaking after talks at Chequers, Mr Trump said the US-UK relationship is "the highest level of special", while Mrs May said they had discussed plans for an "ambitious" trade agreement. Mr Trump and his wife, Melania, later had tea with the Queen at Windsor. 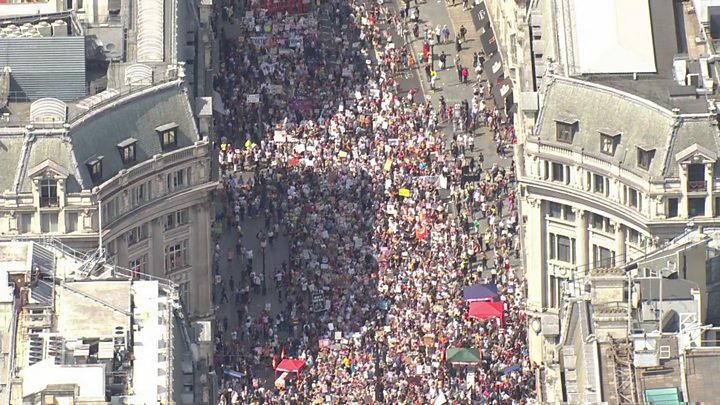 Thousands of people have protested in London against Mr Trump's UK visit. 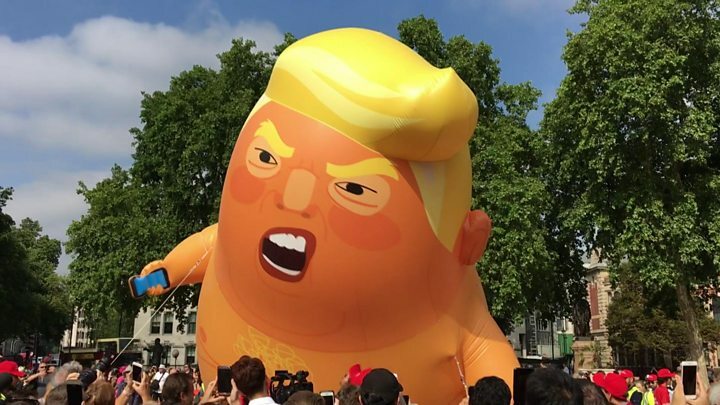 A large balloon, portraying the president as a baby, has been floated in Parliament Square as part of the demonstrations. Other protests are taking place across the UK on Friday and Saturday. 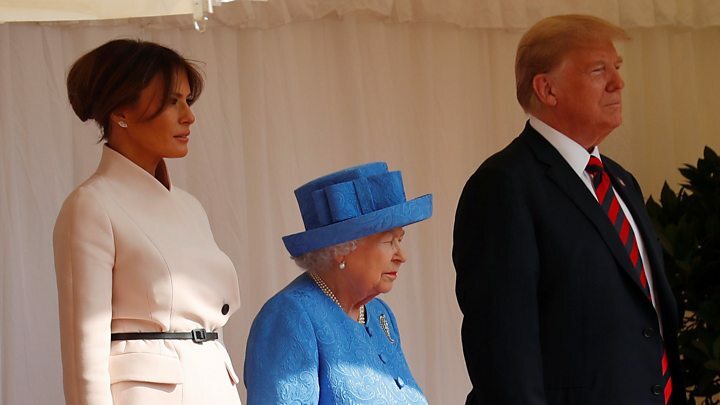 The Queen greeted Mr Trump and the first lady as their motorcade arrived at Windsor Castle. The band of the Coldstream Guards played the Star-Spangled Banner and she invited the president to inspect the guard of honour. Their meeting lasted nearly an hour and was the final engagement in Mr Trump's two-day working visit to the UK. The Trumps took off from Windsor in a presidential helicopter before boarding Air Force One, which flew them to Ayrshire and a weekend stay at his Turnberry golf resort. They arrived at Prestwick Airport at 20:22 BST. Shortly after their arrival at the resort, a protester in a microlight aircraft flew over it, unfurling a banner saying "well below par, Trump, #resist." Mr Trump's first official visit to the UK as president took place in between the Nato summit in Brussels and a meeting on Monday in Helsinki with Russian leader Vladimir Putin. The talks at Chequers came after the Sun published its wide-ranging interview with the president in which he was critical of the PM's Brexit plan. But standing alongside Mrs May after the meeting at her Buckinghamshire country residence, Mr Trump praised her as an "incredible woman" and a "very tough negotiator" who was "doing a fantastic job", and said there could be a "great" trade deal between the US and UK. He said: "I read reports where that won't be possible, but I believe after speaking with the prime minister's people and representatives and trade experts it will absolutely be possible". Thousands of protesters, mainly women, have flooded the streets of central London in the first of the day's demonstrations against against Donald Trump. The crowd is full of whistles, drums and the all important pots and pans that seem to have become a symbol of this movement. Whilst the mood is jovial, their motivation is serious. Most of those I've talked to are here because of Mr Trump's immigration policies, especially after recent pictures from the Mexican border. There are also countless signs on his attitude to women. What has Trump said about your country? At the news conference, Mr Trump said: "The relationship between our two nations is indispensable to the cause of liberty, justice, and peace." He had apologised to Mrs May for the Sun's story - but she told him not to worry as "it's only the press"
He had not given Mrs May advice on how to deal with the EU but "did give her a suggestion... and I think she found it maybe too brutal"
Brexit was an "incredible opportunity" and "whatever" the UK did after it left the EU was "OK with me"
Mr Trump described Brexit as a "very tough situation... between the borders and the entries into the countries and all of the things", saying: "The only thing I ask is that she work it out so that we can have very even trade." Mrs May said the US was "keen" to do a deal with the UK, adding: "We will do a trade deal with them and with others around the rest of the world." She maintained the government's Brexit agreement - which has come under fire from supporters of a "hard Brexit" - "delivers" on the referendum vote. Earlier, Mr Trump said he and Mrs May had spoken for an hour-and-a-half at the black-tie dinner at Blenheim Palace on Thursday, which he attended with his wife Melania. "I think we probably never developed a better relationship than last night," he said. Mr Trump arrived at Chequers by helicopter after visiting the Royal Military Academy at Sandhurst, Berkshire. Meanwhile, Mrs Trump played bowls with the PM's husband, Philip May, at the Royal Hospital Chelsea in London, where she met Chelsea Pensioners and local children and was shown how to make remembrance poppies. Downing Street said Mrs May had presented the US president with a gift of an illustrated ancestral chart of his Scottish heritage through his mother, and his wife with a bespoke perfume called the First Lady in a custom bottle. In his Sun interview, Mr Trump also said former Foreign Secretary Boris Johnson - who disagrees with the PM on Brexit and resigned this week - would make a "great prime minister", adding: "I think he's got what it takes." 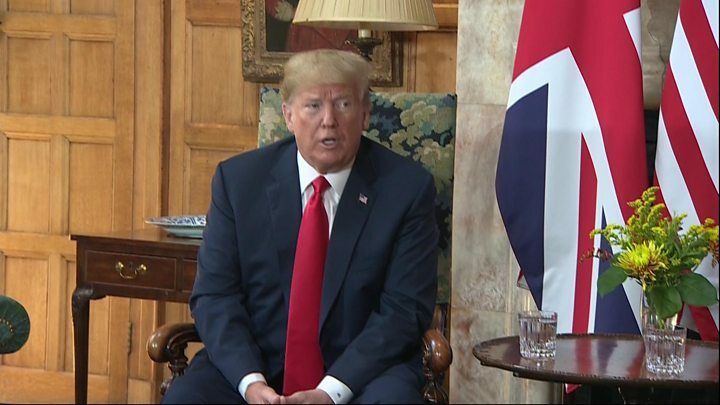 At the news conference, Mr Trump said he had been responding to the Sun's question about Mr Johnson as a possible prime minister, adding: "He has been very nice to me. He's been saying very good things about me as president."